That's the total number of viewers who either watched it live when it was first broadcast at 0200 BST, or viewed a recording later on Monday. Sky Atlantic's repeat of the episode on Monday night attracted a further 698,000 viewers. 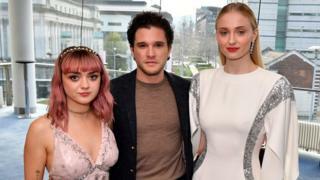 The viewing figures do not account for those who will have watched the episode illegally - some reports have suggested as many as 120,000 people are sharing versions of it online. The Thrones series launch - the eighth and final - received warm reviews from critics. The season will consist of six episodes, but several will be 90 minutes long.